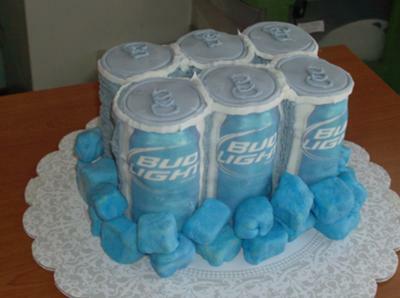 This six pack Bud Light cake is pound cake,the cans are wrapped with edible icing I had printed at the local bakery. The ice cubes are Rice Krispie treats wrapped in fondant. Other pages you won't want to miss! I have never seen anything like this before! Where did you get the idea My Dad's bday is on Wednesday and he would love this! I am going to try and make this! thanks ann for the comment.i used a rectangular pan and stacked 3 cakes together and then carved them by hand. That is a grand cake. Tom you did a fantastic job. What pan did you use to get the pound cake in the cylinder shape?